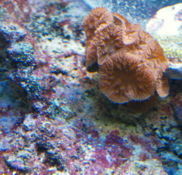 This coral is hardy but does best in an established tank. It prefers a low water current and a medium light level, so does best in the middle regions of the tank depending on the lighting. Can be confused with Brain Corals and some Mushroom Corals. It has many round swollen discs that when open, resemble a Mushroom Anemone. This page was last edited on 3 November 2018, at 10:01.